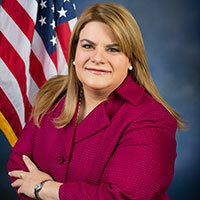 Jenniffer González-Colón was elected November 8th 2016 as Puerto Rico’s sole Representative to the U.S. Congress, also known as the Resident Commissioner. In so doing, she became the first woman ever to hold the office. Ms. Gonzalez-Colón received the most votes (over 718,000) out of any elected official on the Island in the past election. A lifelong Republican and activist for Puerto Rican statehood, Ms. González-Colón entered public office in a 2002 special Election, becoming the youngest member at the time of the Puerto Rico House of Representatives. She then quickly rose through the ranks achieving the post of Speaker of the House for four years and Minority Leader for another four. Her priorities as Puerto Rico’s sole voice in Congress include spearheading the economic recovery of Puerto Rico, securing the equal treatment for Puerto Rico’s three and a half million U.S. Citizens in federal laws, regulations, services, and funding, and ensuring that Congress responds decisively to the overwhelming electoral mandate of Puerto Rico’s voters for admission as the 51st state of the Union in both plebiscites by 61.3% in November 2012 and 97% in July 2017. She has quickly made her presence felt on Capitol Hill, having been elected by her colleagues to the influential Republican Conference House Policy Committee and selected to the Speaker’s Intergovernmental Affairs Task Force. González-Colón is a member of the House Committees on Veterans’ Affairs, Small Business, and Natural Resources, where she is Vice-chair of the Subcommittee on Indian, Insular, and Alaska Native Affairs. She chairs the Puerto Rico Economic Growth Caucus and co-chairs the Congressional Friends of Spain Caucus. González-Colón has sponsored or co-sponsored legislation to improve services to Veterans, provide equal treatment to citizens in the U.S. Territories, protect access to education, strengthen Homeland Security and promote Small Business. She has been recognized by NewsMax as one of the 100 most influential Republican women and by The Hill as one of the new members to watch, and received the National Trailblazer Award from the League of United Latin American Citizens and APEX Award for Mental Health advocacy from the American Psychiatric Association. A product of the Puerto Rico public school system, holder of a Juris Doctor and Master of Laws degree (LL.M. ), González-Colón serves as Chair of the Puerto Rico Republican Party, and First Vice Chair of the local New Progressive Party, the standard bearer for Puerto Rico statehood. She has received recognition for her career as an elected official by the Puerto Rico United Retailers Center, the Spanish Chamber of Commerce, and Manufacturer’s Association and was selected as an Elected Woman of Excellence by the National Foundation for Women Legislators, among other awards and memberships.